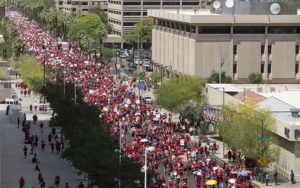 The math is really simple: if everyone who marched through downtown Phoenix in April can knock on doors to talk to voters, we will win this election. Think about the amazing energy that we all experienced that week, and think about the hard work that we all put in for weeks to lead up to that. The actions we took and the conversations we had with colleagues and community members were critical in gathering support for increased teacher pay. Those same conversations need to happen again … this time with voters leading up to the election. Even national outlets like Vox have identified Arizona as a key battleground for state legislatures. They specifically mention Legislative District 17 as a key battleground race, and AEA has identified LD17 as one of its 3 targeted districts, as well. Luckily LD17 is in our backyard, and features two candidates who are strong supporters of public education. Both House candidate Jennifer Pawlik (a former CEA member!) 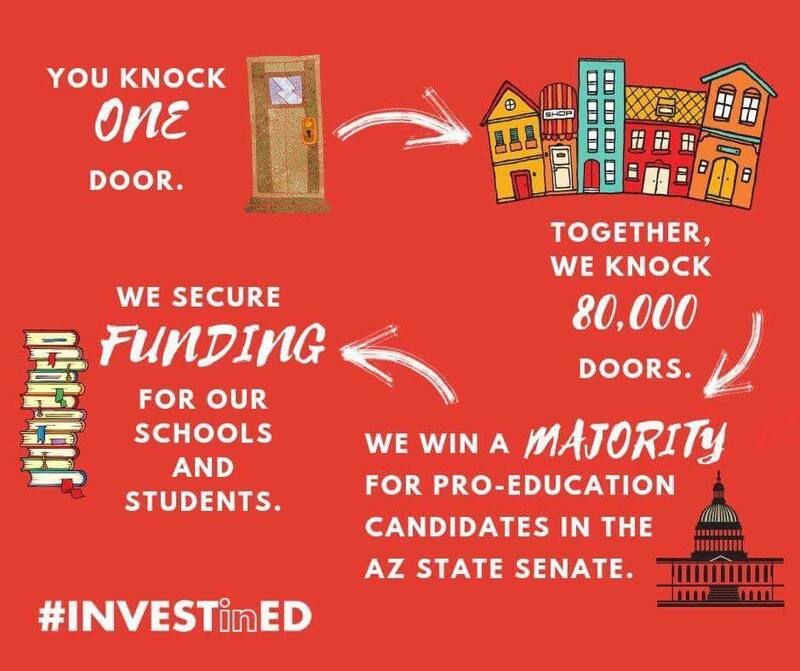 and Senate candidate Steve Weichert have signed the Invest in Ed pledge, and would be vast improvements over their opponents Nora Ellen, Jeff Weninger, and J.D. Mesnard. They have a real shot to win, but they need our help. CEA is challenging ALL of our sites to get members and non-members to knock on doors for #Knocktober and help get candidates like Jennifer and Steve elected. If every site had even just a couple of teams of 2-4 people each, we could knock on thousands of doors! The sites with the highest level of participation will receive a bagel or doughnut breakfast. Just post a picture of your canvassing team on our Facebook or Twitter page! There is literally canvassing happening every day until Election Day! 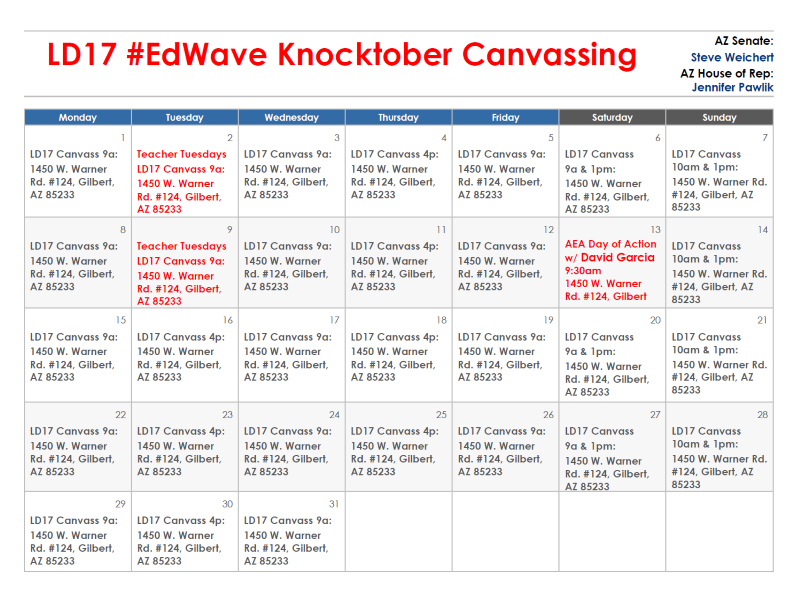 Click on the LD17 canvassing calendar below to see what your options are … then go canvass! Although we hope you will focus your efforts on LD17 because it is such a swing district, there are other candidates you can canvass for, as well. Use this website to find canvassing or other volunteering opportunities for pro-public education candidates! In a nutshell, research shows that it works. Polls also show that voters respect and value teachers, and they are very willing to listen to what we have to say about the election. After raising so much awareness about public education in the spring, it is critical to use that awareness now while the issue is so prominent and we have a real chance to impact an election. We are knocking on targeted doors, not just knocking on every door in an area. The voters on your list will be moderate voters who are generally very willing to listen to what you have to say. Canvassing is always more fun with a friend. Very few canvassers knock on doors by themselves … most of them bring a “canvassing buddy” because it’s easier and more enjoyable. Feel free to do the same! Canvass drivers can help, too. If you’re not ready to knock on doors just yet, volunteer to be a driver for those who are. It will help keep them cool, hydrated, and rested, not to mention help them knock on doors faster. You may even see their experiences firsthand and realize that you can probably knock on doors, too! 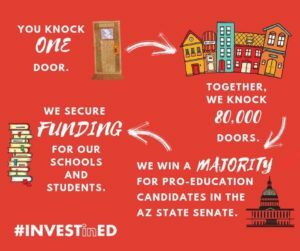 One of our own members has been doing such a great job canvassing that Invest in Education featured her in a recent video. Click here to check out this awesome video of the amazing Jennifer Chastain!